This is why you usually want to reveal your kinks somewhat midway into the relationship, usually after second base and before the (marriage) proposal. Well, first, the postnatal checks. Do you want to be circum - wait, that's my voice as your legal guardian. I say yes. When I was a kid, I heard the term "adult diapers," and I was like, "What? Why would an adult need diapers?" Then I got a little older, and I was like, "ohhh..."
Then I got older still, and I was like, "OH." 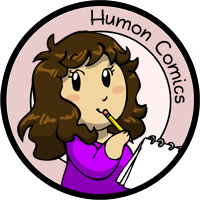 Oh Humon, I can always rely on you to do whatever it is you do. A lot of stuff goes on in Humon's mind, this we can be sure!! What was the inspiration for this??? I'll admit, I chuckled hard enough coffee came out my nose on the last panel. ... I'll never understand people.